Medium - $64.99 Only 8 left! Large - $64.99 Only 5 left! X-Large - $64.99 Only 5 left! This year, the three-ring circus is not for the faint of heart. It comes straight from the nightmares that people don't wake up from. The front row audience is guaranteed to get blood on them (if they're not eaten by zombies first). And the acrobats perform over a bed of spikes instead of a safety net (and the audience loves it!). It's a show by and for the gruesome undead, and it's going to need a leader... someone with enough psychotic charm to lead ghouls, and yet horrifying enough not to be overshadowed by the performers. Sound like the perfect job for you? If the answer is "mmmmyes," step right up, and don the Men's Mad House Ringmaster costume this Halloween! It's got the classic "top coat and tails" for that signature look of the "Old World" ringmaster, but with something just slightly... off... and creepy. The jacket has a vest sewn on the inside, and faux fur lapels with a slightly tattered texture for a frighteningly realistic look. 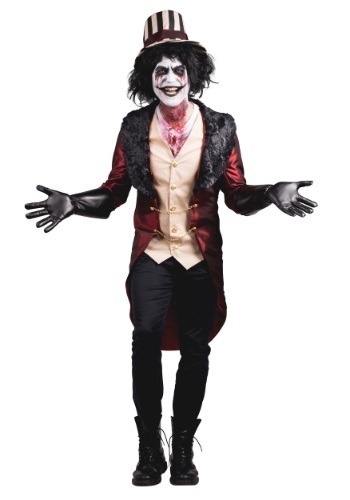 The suit also comes with elbow-length gloves, and a top hat that has the vertical stripes similar to the outside of a "Big Top" circus tent. You'll look like the real thing when you announce your main attractions to the audience, like the "World's Hungriest Walking Corpse," the "Deadliest Serial Killer Known to Man," and "The Amazing Human-Eating Hannibal Lecter." Just don't forget to check out the rest of our selection for the finishing touches, like pants, wigs, blood, zombie makeup, and more! Bought for my hubby, the jacket is great but the hat and vest aren’t the greatest. So we are going to give it a wee make over. However it’s still a cool outfit just the hat is rubbish.